Be-Ecolo.com is a new website about ecological issue. The main objective of this websites is to show how to conciliate economic issues and ecologic issues. You can find in this websites plenty of tips in order to consume less energy and to save money. In this appliance, you can see the global pollution in direct. 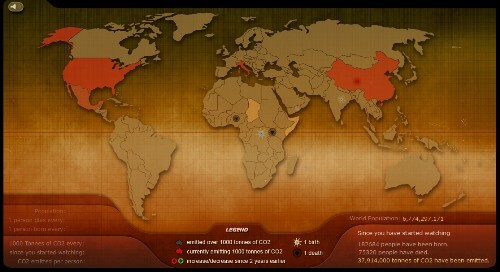 You can see the huge part of the USA, Europe, China and Japan in the world contribution of greenhouse gases. Then, I suggest you to see the little cartoon (below this paragraph) which explains very briefly the main concerns of pollution, and which solutions can we apply to fight this problem.